Each week I do a weekly reading for myself to understand the theme and energies I may work with in the next week. 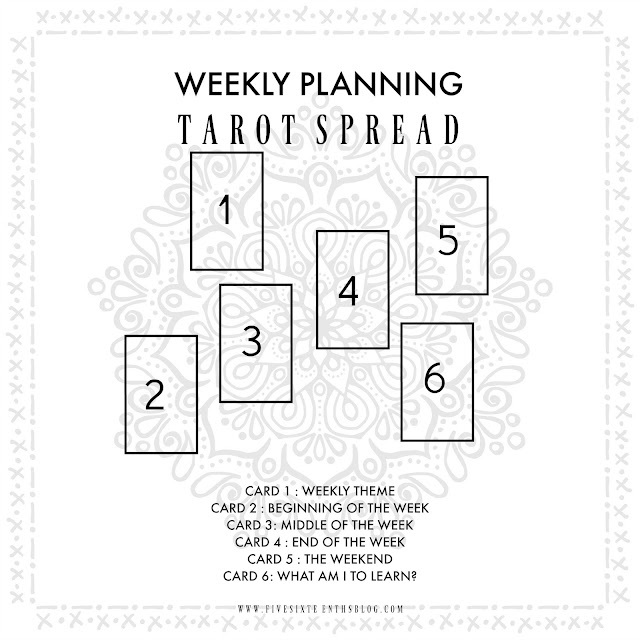 While I don't believe that the Tarot is a predictive tool, this spread does help me understand what to plan for in the next week and what I should be working towards for my higher good. To me, Tarot is a self development tool. It is a tool that helps us align our selves with the things we must do & be in this life in order to live our best life. Doing a weekly spread lets me know what may be at play so I can plan my week accordingly. I do a lot with my blog, YouTube channel, and my day job so anticipating what energies may be at play or what my focus may be during the week allows me to plan. For example - I'll see what I need to focus on in the next week. The cards I use here are the After Tarot, the Sacred Wild Soul Soul Searching Deck, and the Spirit De La Lune Deck. I also use these positive affirmation cards for my mantra for the week. In the spread above, the beginning of the week will be about reinvesting. So I should do some work to get things done - reinvest in business, work, etc as demonstrated by the suit of pentacles. I take this as working on my blog, YouTube, etc because that's always a big focus of mine. Then the middle of the week I should slow down and focus on relationships. Put the business things away and focus on friendships, partnerships, working with others to build strong bonds. Maybe I should be more open when it comes how I interact with others and how they interact with me. At the end of the week - today, when there is the New Moon - I should focus on myself, focus on my intuition. Dedicate time to this relationship and this balance. That is what the two is about after all. And finally, this weekend I should be looking for truth, finding what is fair and balanced. Be open to changing what I'm doing to achieve this balance. As you can see none of that is really predictive as we move through the week. It is what I should work on or focus on during the days of the week. These positions can be further enhanced by my daily pull too. Here's a breakdown of each position. For this position I usually draw a Tarot card as well as two oracle cards. I use the Soul Searching Oracle and the Spirit de la Lune deck to discover the main theme of the week ahead. This is the thing that everything will come back to this week. Perhaps it is what you should do or what you should let others do, none the less it is the over arching subject that will work through the coming week. This card, like the next 3 cards, has a pretty obvious position here. The expectant energy or theme of the beginning of the week. For me this card goes from Monday to Tuesday but if you're starting your week differently this can apply to the first two days of your week. Again, pretty obvious. Since this is the pinnacle of the week this energy is important. It may play into the energy of the next card as you finish out your week. This position is for the end of the 5 day week. I use this spread because I'd like to know what energies are at play through my work week with a different card for the weekend. For this position, the card draw represents the energy or theme of the weekend - Friday night, Saturday, & Sunday. For me, my work week ends on Friday at 4pm....but I go on for the next few days working on my blog, YouTube, etc so this card lets me know how productive I may be those days. Seeing the energy helps me prepare my to do list. After working through all of these cards for the week, this position is the outcome. What will you learn working towards the main theme of the week? I often reflect on this card at the end of the week to incorporate this reading with the daily pull I do. This card represents what you will learn this week but it also helps you anticipate how to learn this through the week. Tarot isn't a fortune telling tool for me, even though this reading seems predictive. It is more of how can I be the best this week? 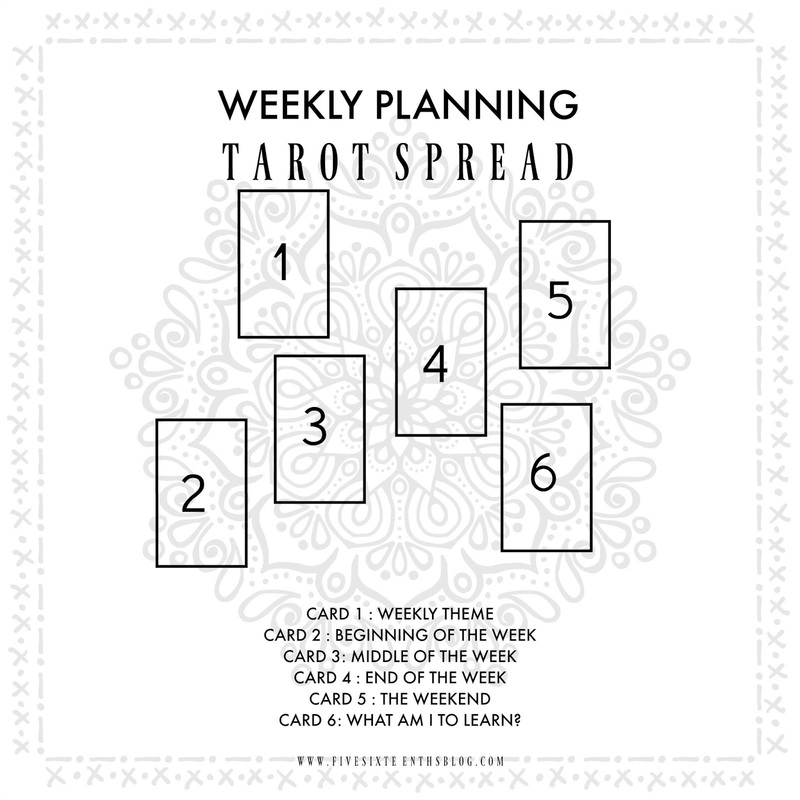 It helps me see what themes may show up this week and how I can emulate and prepare for the energies of the week. I incorporate my daily pull with this reading as well. How can my daily pull work with the energy at that time of the week? I log my weekly readings & my daily pulls (plus new moon, full moon, and monthly spreads) in my Moon Planner. I love this guy because there's a lunar calendar and each week has a blank page perfect for these weekly readings. This planner has a ton of resources if you work with the lunar cycles - and even if you don't, it's pretty dope as a Tarot journal anyway!! I hope you pick up a deck of Tarot cards and use them as a self development tooL. I really want you to be able to use these guys easily so I've put together this Tarot study guide as a reference. It will help you break down the deck into manageable chunks to help you create your own personal, and intuitive connections to the cards. Pick it up here. And if you want a peak into my little sacred space, you can see a little bit of it in this post.